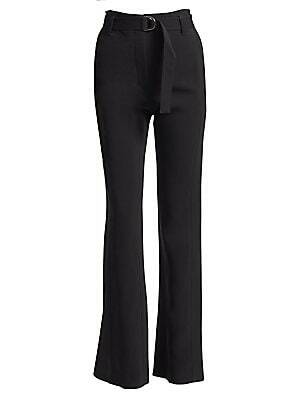 A pair of on-trend flare trousers accentuated with a belted waistline and pintucked details running down both legs. 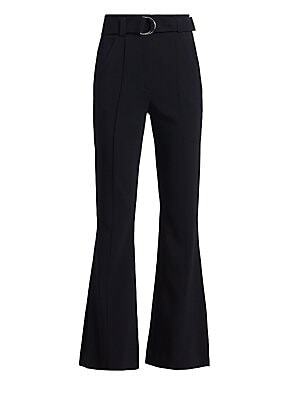 Belt loops Adjustable belted waist Front slant pockets Back welt pockets Viscose/elastane Dry clean Imported SIZE & FIT Rise, about 13" Inseam, about 33" Leg opening, about 22" Model shown is 5'10 (177cm) wearing US size 4. Contemporary Sp - Workshop. A.L.C. Color: Midnight. Size: 12. 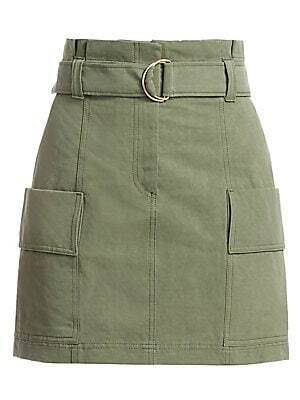 Industrial-inspired skirt flaunts portable flap pockets and an adjustable buckle belted waist. Belt loops Zip front with hook and adjustable buckle belted waist Front patch pockets Cotton/linen Machine wash Imported SIZE & FIT Mini silhouette About 18.5"